No one on the road is colder and crueler. Shows no mercy to Autobots who happen to be on the highway with him. Seeks to destroy Optimus Prime so he can claim to be "King of the Road". Can survive a collision with anyone, except Optimus Prime. Reaches a top speed of 140mph and can shatter a 20-foot concrete block. Uses a 400mph wind producing cyclone gun. 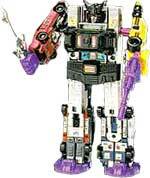 Forms robot "Menasor" with fellow Stunticons. Look out motorists -- he exults in the accidents he causes! Driving recklessly, screaming and laughing. Some comrades think it's an act, others really know he's as nuts as he appears. Fears quiet, prone to tire blow-outs. In car mode goes up to 250mph with amazing maneuverability. In robot mode, his scattershot gun sprays laser beams over wide areas. Combines with fellow Stunticons to form "Menasor". Sullen, fatalistic, sees little reason to continue Transformers' war. Motivating him to fight is always a problem. Vain -- Spends most of his time shining himself. In car mode, goes 220mph. Radar scan covers 200 mile radius. In robot mode, has a compressor-air gun that shoots a 40,000 psi blast of air. Combines with fellow stunticons to form "Menasor". Nasty, underhanded, loves to gloat over his victories. Would rather be scrapped than lose. Prone to overheating. Megatron would sooner melt him than talk to him, but knows he's even worse company for the Autobots. In car mode, has a plasma-energy blaster. Carries a gravity-enhancing gravito-gun. Combines with fellow Stunticons to form "Menasor".